In 2017, Praxis celebrated two decades of success as a niche provider of subrogation recovery services. 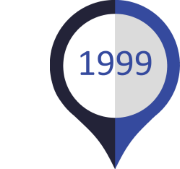 When James Robert Ford (Rob) began our firm in 1997, he focused on identifying overlooked subrogation opportunities in New York and New Jersey, and providing recovery services in no-fault markets, a nearly unheard-of enterprise at the time. Initially, Praxis provided limited recovery services regionally to the property and casualty insurance industry. Our success allowed us to subsequently expand into collision recovery and in providing subrogation recovery services for auto and property insurers nationwide. We continued to grow with the acquisition of Aon Corporation’s subrogation services business in 2010 - adding Workers Compensation and Disability Insurance subrogation services to the Praxis portfolio. Today, we have offices in Bohemia, NY, Beverly, MA, Fleming Island, FL, Indianapolis, and Bloomington, IN in addition to our headquarters in Muncie, IN. Praxis Consulting was formed with an initial focus on identifying and recovering overlooked subrogation opportunities in the New York and New Jersey no-fault markets. Based in Muncie, Indiana, our centrally-located headquarters allowed us to expand our reach and gave us easy access to insurers nationwide. Entry into new markets opened the door to new lines of business and growth. Praxis Consulting entered the collision platform, and began providing subrogation services for auto and property insurers including arbitration management. Praxis Consulting acquired new competencies, grew its staff substantially and transformed itself into a complete subrogation service provider at the request of existing customers. Praxis Consulting acquires Aon Recovery, Inc. from Aon Corporation adding Workers' Compensation and Disability Insurance subrogation services to the Praxis Consulting portfolio along with establishing additional offices in New York and Massachusetts. Praxis Consulting is a full-service subrogation outsourcing firm working with the nation's top insurance carriers.